Nearly 20,000 industry professionals and 10,000 book consumers descended on New York City late last month for BookExpo America (BEA), held May 29-31, 2014 at the Javits Center. As in years past, IBPA was honored to host a cooperative booth during the convention showcasing 339 unique member titles and hosting 36 book signings. 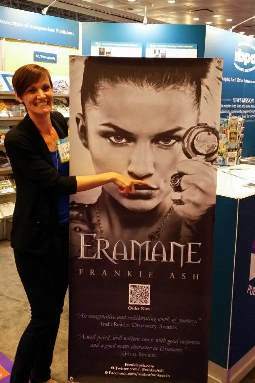 IBPA member and author/publisher of ERAMANE, Frankie Ash (photo right), wrote a blog post recounting her adventures in book signing at the IBPA booth. You can read the post here. Frankie signed 30 books in under 15 minutes and had to hand out rain check forms to those who couldn’t get a copy onsite. The IBPA cooperative booth received a face lift this year. The 339 member titles were displayed within an open concept booth that embraced the teal and pink IBPA brand colors. In addition, several of IBPA’s Benjamin Franklin Award winning books were featured in a special “hero case” (photo right) built specifically for calling attention to award winning titles from IBPA members. 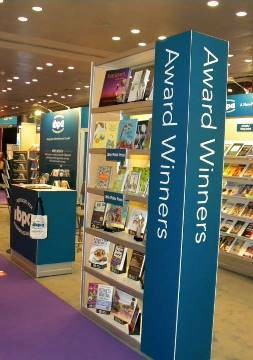 The full catalog of member titles displayed during BookExpo America 2014 is available here. The full photo album is here. Special appreciation goes to Terry Nathan, IBPA’s Chief Operations Officer, for seeing to every detail related to designing and setting up the booth and making sure all books, postcards, and giveaways made it to the show on time. In addition to the activity occurring within IBPA’s booth, and thanks to a new partnership with the Mom’s Choice Awards, IBPA was able to offer nine members the ability to record branded interviews for use on their website and within multi-media PR packets. This was the first year IBPA hosted the special author/publisher interviews, but it won’t be the last! You can check out IBPA’s booth in action and listen to one of the interviews, a talk with author/publisher Lynn Gaertner-Johnston about Business Writing with Heart, below. To kick off BEA on the evening of May 28, 2014, IBPA hosted the annual Benjamin Franklin Awards ceremony. The packed room of 230 industry professionals was treated to an unrivaled view of downtown New York City featuring both the Empire State Building and the Chrysler Building. Photos below. Among the books taking home Gold were The Old Man’s Love Story by Rudolfo Anaya in the category of Popular Fiction (publisher: University of Oklahoma Press), Brave the Unknown by Ushi Patel in the category of Poetry/Literary Criticism (publisher: Skywriter Books), and Tuesdays with Todd & Brad Reed: A Michigan Tribute by Todd Reed and Brad Reed in the categories of Cover Design and Interior Design (publisher: Todd & Brad Reed Photography). Surviving Sandy: Long Beach Island and the Greatest Storm of the Jersey Shore (publisher: Down the Shore Publishing) received a great write-up in their local paper for winning more honors than any other book in the 2014 Benjamin Franklin Awards competition. Check it out here. A complete list of Benjamin Franklin Award winners is available online here. Additional photos from the ceremony are available here. An important job for anyone attending a professional trade show is to learn as much as possible about new products and services coming to market. The IBPA staff met with several companies during the three days onsite and will be exploring opportunities for members to partner with these new services. In addition to the new business above, IBPA staff met with old friends from NetGalley, Ingram Content Group, Publishers Weekly, Papertrell, King Printing Company, Global PSD, Kobo, BookBaby, The Fisher Company, Smith Publicity, The Peter Beren Agency, Edwards Brothers Malloy, Freisens, and New Media Website Design. Members interested in any of the companies listed above should contact IBPA Executive Director Angela Bole for more information. As one might expect, a major topic of conversation during BookExpo 2014 was the dispute between Amazon and Hachette. Although Patterson’s point of view was supported by many during the convention, according to Publishers Weekly, Patrick Hughes, Fulcrum’s marketing and sales director, didn’t agree. As important an issue as it is, an industry can’t talk about only one thing for three days. Business is more interesting than that! In addition to picking sides in the Amazon/Hachette case, people were also buzzing about the first ever BookCon. On Saturday, May 31, 2014, BookExpo America switched from a professional trade convention to a consumer book fair akin to what one expects from Comic Con. Those with complaints about BookCon focused on overcrowding resulting in long lines and security issues. The separation of BookCon from the general trade show was also an issue for some. Publishers who wanted to showcase their books to BookCon attendees as well as the book professionals attending BEA needed to invest in a separate booth in the BookCon area. This led many to ask whether BookCon was simply a money grab disguised as a consumer fair. For those interested, Boris Kachka wrote an apt assessment of both sides of the BookCon issue for Vulture.com. His piece, entitled “BookCon’s Debut Was Chaotic, But Promising”, is available here. There’s no rest for the weary! 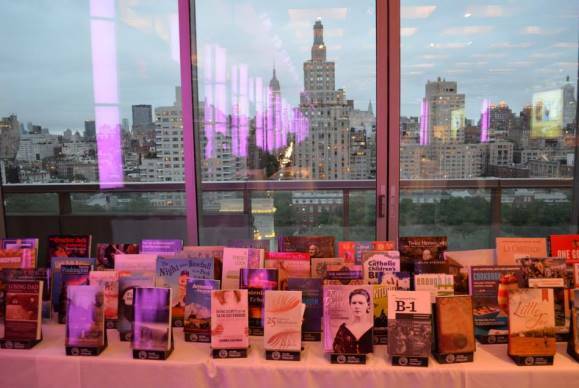 IBPA is already gearing up for BookExpo America 2015. We’re looking forward to seeing many of you there and to a successful twelve months for all in between. Here’s Your BEA Team! Pictured above from left to right: Chris Kahn (Vendor Relations), Molly Farragher (Project Coordinator), Terry Nathan (COO), and Angela Bole (Executive Director). 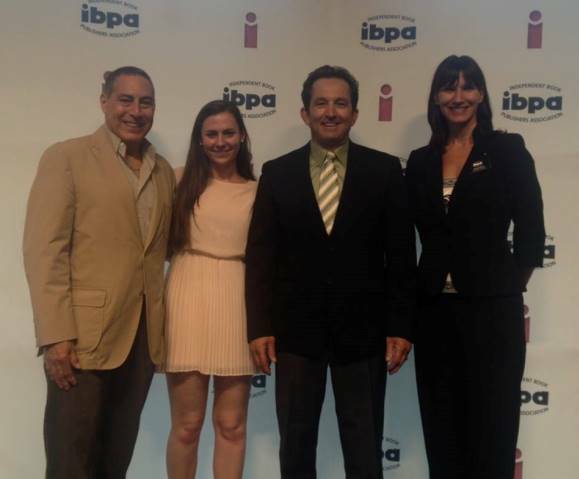 In addition, IBPA’s participation in BEA wouldn’t be possible without the unwavering support and enthusiasm from our Executive Assistant, Patti Grasso, and our graphic designers, Francesca Droll and John Webster from Abacus Graphics.